Having spotted this once-glorious Olympic venue re-imagined as a Wonka-fied water park dubbed the Happy Magic Water Cube, giving a second life to an international showpiece that had quietly fallen into disuse by bringing a fantastical variation of a day at the beach to the landlocked residents of Beijing, we couldn’t help but wonder what other wet, wacky parks exist in the world. 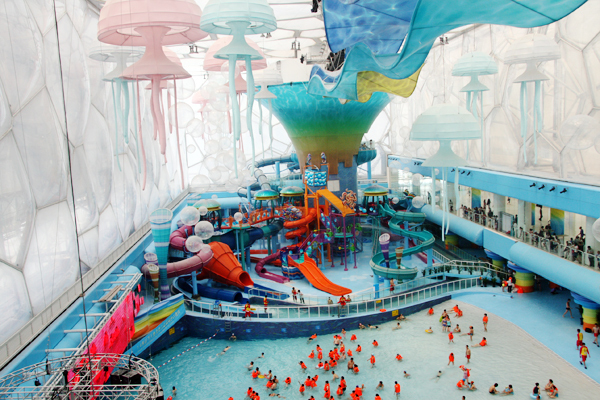 The original Imagineer and creator of the happiest place on Earth, Walt Disney, once said that “it’s kind of fun to do the impossible.” Surely the bizarre water parks of the world are testament to that statement. From a giant King Cobra water slide meant to mimic sliding down a snake’s slippery back to the most crowded wave pools in the world to lazy rivers in a land before time, click through to check out the strangest feats of aquatic, pleasure-seeking imaginations around the globe. Let us know in the comments which you’d like to visit, if any!